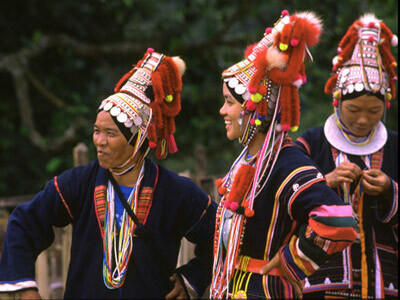 Posted on October 6, 2011 by Thannaree C.
In the traditional Akha view art is something one wears. They don’t hang their creative work on walls. They put it on their bodies. To an Akha, art is the adornment of everyday being and to wear it is to make a statement at once ethnic, personal and aesthetic. The Akha jacket best exemplifies this attitude. There are types for young or old, male or female, with stylistic variations from one Akha group to another, but every jacket maker starts off with the same basic hand-woven cloth—dyed a deep blue—and cuts, shapes and works on it the same way. The whole process starts with the harvest of cotton, which has to be deseeded and cleaned first. So the first step is to remove all the foreign matter by running lumps of raw cotton through the rollers of a simple gin, which crushes the seeds. Then the Akha fluff it up with a bow and the pieces of seeds, leaves and twigs fly out of the mass. After that they roll the cotton into sausage-shaped rolls on a flat board and store them in a bamboo section or small basket, which can be tied around the waist so that the woman may spin while she walks. 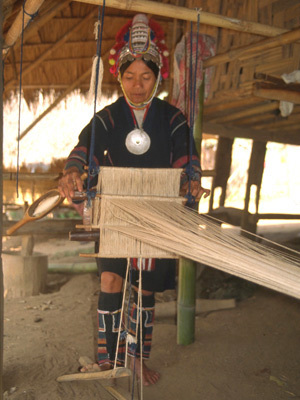 To spin thread the Akha woman takes a roll of cotton, hooks it onto her simple drop-spindle, gives it a fast turn on her thigh to set it spinning, lets it drop, then draws out the thread. Spinning is the first skill taught young girls, since the mother alone can’t spin the whole family’s requirements. Girls learn to spin thread while sitting around at home on the balcony, while walking to and from the fields, forest or water sources, or when visiting friends. The loom is a simple contraption, easy to put up and take down, comprising two pairs of erect bamboo poles about six meters apart, connected by bamboo rails, with perhaps a roof overhead, since most weaving days will be quite sunny. The weaver stands in the middle, operating two treadles by foot to shift the string heddles, which separate every other thread and are attached to the treadles. She simply steps on a treadle to open a shed, tosses a shuttle of weft thread, which binds the web together, through the opening, then slides the reed towards her to knock the weft thread into place. She then presses the other treadle, opens the complementary shed and repeats the process. Thus, thread by thread, the cloth gets woven. gardens, and become the basic cloth of jackets, caps, skirts, bags, halters, leggings and trousers. For a jacket, the Akha woman cuts two equal strips of dyed cloth, stitches them together halfway, then begins her embroidery and appliqué, to later add the sleeves and, if required, collar and front flap. Women’s jackets reach to mid-hip; men’s are sometimes shorter. 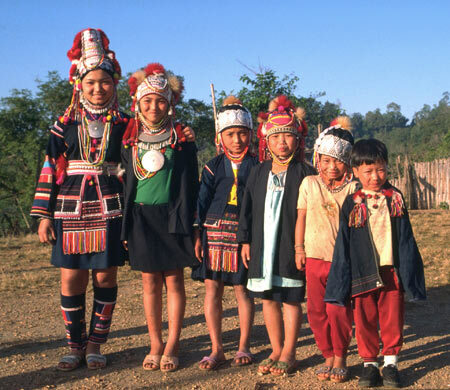 There is quite a lot of variation in this basic Akha style, for each of the three Akha groups resident in Thailand employs a particular blend of motifs. 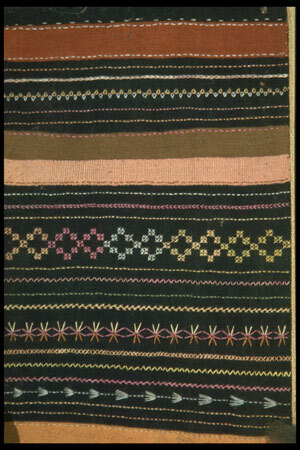 Some of the embroidery patterns overlap from one group to the next, but the overall composition among Thailand’s Akha is distinctively Ulo, Lomi or Pamee style and it doesn’t take long to recognize and remember the differences. The Ulo style features up to thirty or more tiny running stitch lines in varying colors, covering the lower half of the jacket on both sides. Some of these are simply lines, small zigzags, loop stitches, connected x’s, all of which help set off the more elaborate, wider rows of complex stitches. Ulo Akha women have assigned names to several—spider’s tail, centipede, chicken feet, snake stripes, meeting of curves, braid, eye, ankle and flower stitches—but many women embroider the patterns without knowing the names of them. No two jackets are exactly alike, for an Akha is incapable of repeating herself. Same colors and patterns, maybe, but put in different positions on the jacket. 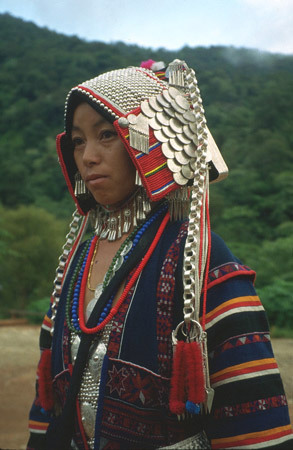 To an Akha, each jacket must be unique. blades they usually attach chicken feather tassels or gibbon fur. There is no collar, instead a long thin strip of colored cloth borders each side and runs down the back as well. The sleeves feature several bands of bright, strong, contrasting colors. The men’s jackets are the same length, with collar, only a single band of color on the sleeves and generally embellished only with the little silver half-globes called chukhaw with a horizontal row of them across the waist on the back, a perpendicular row up to the collar and a few at hem corners, where the color bands meet. The distinguishing characteristic of Lomi style jackets is the use of appliqué. Women cut rows of connected diamonds or triangles from a thin strip of cloth, sometimes varying the colors, and lay these upon another thin strip of colored cloth. Next they outline the pattern with a strand of three or four twined threads placed along the design borders and stitch the whole onto the strip, which is next attached to the jacket or sleeve. The common jacket design has two or more rows of appliqué, with bands of embroidery in between. The stitching patterns include some of the easier Ulo ones, as well as mazes, circular stitches, connected squares, crude geometric designs and stylized trees. Each has its special name—flower stitch, drum, moon and sky, splashes of rain, etc.—as do the appliqué designs. The usual woman’s jacket hangs slightly lower on the hips than that of the Ulo, with patterning heaviest on the part below the waistline, for traditionally they are worn with very wide belts. Young, unmarried women sport a style with more color and rows of appliqué on their sleeves and with beads and coins attached to the hem. Cowries, beads, job’s tear seeds and horsehair tassels are common embellishments. Men wear a shorter jacket, with a collar and a front rectangular fastening flap that buttons above the heart. There is less color on the sleeves but the front flap is usually heavily embroidered, bordered by colored bands and often has a red or brown patch in the center. simple, with little embroidery, just rows of attached strips bordered usually, though not always, in white. A row of coins in the front serves as fasteners and there is no collar. appliqué she then cuts long thin strips of colored cloth to border the edges, two contrasting colors on each side, which may or may not be identical. Usually only the sleeve colors are symmetrical, as the women prefer to use as many colors as they can get. One band on each side runs down the front and usually another single band runs down each side from the top of the sleeve, around, under and along the joining of the front and back. 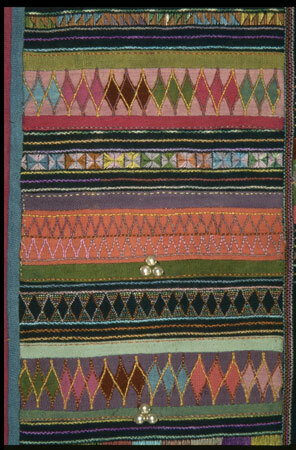 It’s this use of colored bands, along with the cut of the cloth, which gives the Akha jacket its particular identity, for all styles use them roughly the same way. fur, with half the tuft dyed red and the other half white; small horse hair tassels; small white Job’s tears, round or cylindrical, seeds that are easy to string and attach along jacket hems or around headdresses; the iridescent wings of shiny, bright green beetles; and cowry shells, one of the most frequent decorative devices. In the past people used cowries as a medium of exchange in the regional markets. So they symbolize wealth. To fit them flat against the cloth an Akha has to make an incision, and it’s usually done with a full-sized machete, under the hump on the back. Then the hump can be popped off with a twist of the blade. old Thai 5- and 10-satang coins, with the hole in the middle, are common on bags. So are the old Burmese ‘lion coins,’ the large ones turned into buttons, the small square and scalloped ones attached to jackets, belts and bags. The last major decorative device is the chukhaw, or the small half-globes of silver that come in three main sizes. They are a basic component of the headdresses and also used on jackets. They are pounded out in a mold mounted on a tree stump at the blacksmith’s. Nowadays there are cheaper ones of tin or aluminum available in towns. 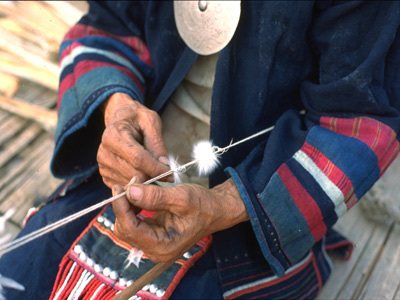 The chukhaws are perforated on each side with a tiny hole and so are sewn directly onto the cloth. 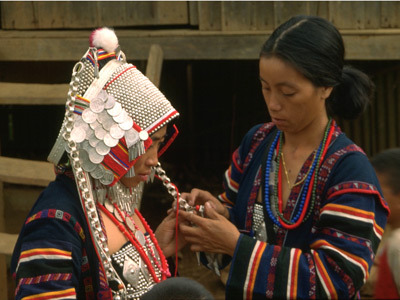 For making a headdress the Akha woman will sew a row of these on a cloth cap, separated by a row of beads, then add more chukhaws, or more beads or buttons, depending on the style. Headdress styles differ just as much as jacket styles. with rows of beads, chukhaws, buttons, bangles and surmounted by a big tuft of red and white gibbon fur, while dangling down the sides are several long red chicken feather tassels. A row of silver rupees hangs over the brow and a vertical row of coins frames the face. Several strands of beads are attached to the cap and fit under the chin. Lomi women use more silver, bigger chukhaws, and have a repoussé plate attached to a thin plywood trapezoid mounted on the back of the cap. Extremely long feather tassels and beads descend down the back of the headdress. Large coins and hollow silver balls are attached to the front and sides and hang freely. They sometimes keep a complete toiletry kit tucked up in various parts of the headdress—little mirror, toothpick, tweezers, brush, etc. And they might add on whatever wildflowers are in season. ring chains and pendants. The sides of the cap are trimmed with beads and covered in silver rupees and the weight in silver of a proper Pamee headdress is 4.5 kg. but girls switch to a more elaborate design. 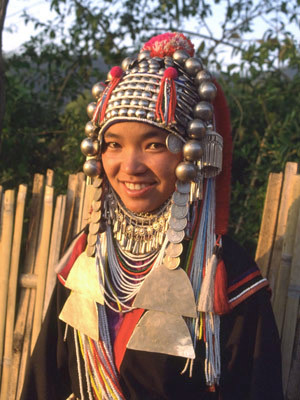 Lomi girls wear a silver-laden cap that is essentially the headdress without the back plate. 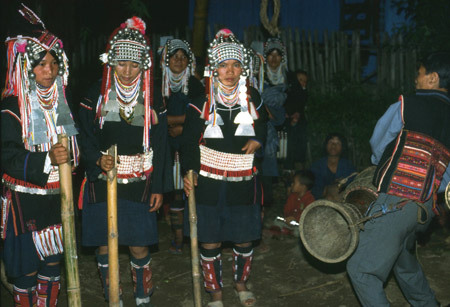 Pamee girls wear a round cap covered with chukhaws and a few large, diamond-shaped, inscribed silver plates, plus gibbon fur and chicken feathers. Ulo girls wear a beaded cap with several long feather tassels streaming out the back, with large tufts of red and white gibbon fur over the ears and on top. today, other than at major festivals. For special occasions he tucked several colored feathers in the sides, or perhaps draped a silver chain on it. 60 cm strip from her bolt of deep blue cloth and embroiders and appliqués half of this, which will be the front of the bag, in the style of the back of a jacket. After attaching the shoulder strap she borders the design with color bands and rows of beads, cowries and coins to the extent desired. Tassels of chicken feather and horsehair are common embellishments. Akha clothing item. The beads of it sway with the skirt when she walks. The halter has a single diagonal strap and is designed in the same style as the other items. It fits over the breasts and goes down to the navel. The leggings, designed to protect them in the fields and jungles, are tied just below the knee with beads or strings and reach down to the ankles. 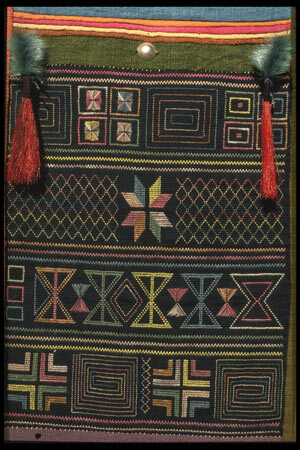 They are mainly appliquéd with bands of colors, though the Lomi women add a row of triangles or diamonds. There are rules for girls to follow in progressing from one type of costume to another. They may only make changes on two occasions of the year—New Year and the Swing Festival. The first change is the progression from the child’s cap to the young girl’s. This takes place at about the age of twelve. About five years later she begins to wear the jejaw. Finally, she changes her cap for an adult’s headdress. Pamee to the narrow variety, as well as flat neck rings, which no other tribe wears. Other silver ornaments, from flower-shaped filigreed pendants to the large rings shaped like the Greek letter omega, are attached to the sides of their headdresses, or strung in a row for use as a chinstrap. The source of silver was usually the silver rupee coin of British India, 92.5 per cent pure. Fully dressed and adorned in the traditional way, the Akha stand out resplendently in their jungle environment colors of greens and browns. To get that way required many hours of meticulous workmanship. But it was all worth it. It made them the most beautiful beings in the forest. This entry was posted in Arts & Crafts, Hill Tribes, People. Bookmark the permalink.